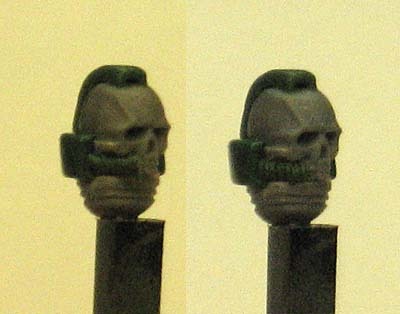 When I posted this model way back, I got a number of questions about how I sculpted the Chaplain skull helmet. That meant a tutorial was in order. I have to be honest, the pics for this one aren't the greatest... my camera just would not work with me on this one. Nonetheless, the idea is here and with a little work, you can have one of these in no time at all. You'll need a suitable skull obviously. They come in all sizes, but I prefer these here for some reason. They're just the right size and have some nice angles to them. 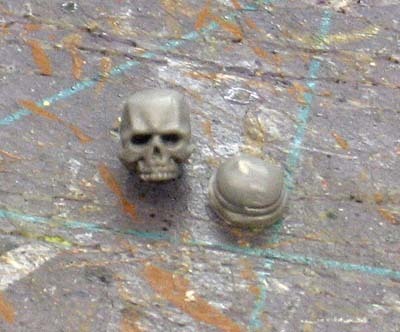 Most skulls you find will be "smaller" than actual helmets but that's perfectly fine since you'll be adding to it with greenstuff. Just be careful not to get one that's too small. You'll need an old helmet that you can cut the neck portion away. That's all you need from the helmet so it doesn't matter what condition it's in, you just need the base. And greenstuff for the rest of it. 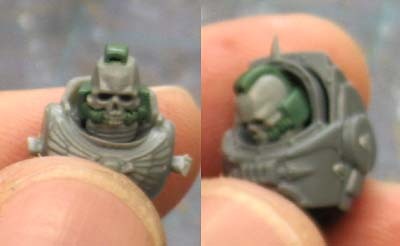 First thing is to clean up your skull and cut the neck away from the helmet. Make sure the top of the neck piece is flat along with the bottom of the skull jaw. Take the skull and glue it to the neck piece allowing a slight bit of the jaw to hang over the front of the neck. Next you take a bit of greenstuff and fill in the void on the backside of the skull. The first portion of the helmet we'll be adding is the part that goes around the back of the skull. Take a piece of greenstuff and wrap it around the skull. You keep working it until it's the same thickness around and a consistent height. You don't want to come much higher than the eye sockets and not much lower than the start of the collar. If you go too low onto the collar, you'll prevent the helmet from sitting properly in the torso opening. And it obviously doesn't go all the way around the skull. I cut it off about halfway up the side of the skull. There's no exact place to do it, whatever looks best to you. You want to leave enough skull visible so that you can tell what kind of helmet it is. Next up is the ridge vent. Adding another piece and flattening it out like you did the horizontal portion, you trim it down until you have something that suits your needs. And last but not least, the cables that run along side the jaw. Take a thin roll of greenstuff that is about the length of the space you have between the front face of your horizontal portion and his teeth and press it into place. Once you have it in place, you carefully cut grooves into it to simulate the ribbed cables. This part can be tricky as it can be tough to get the greenstuff in position without damaging it. Then repeat for the other side. This conversion really only works on power armoured models. You can see how it just does not fit into a terminator torso. And, if that wasn't enough, you'll notice the neck is exposed on this guy. It's because his face doesn't extend forward like regular power armoured helmets do. You can solve the problem by adding a collar to the torso or even using the plastic Sergeant chestplate on your conversion to save the need to sculpt a new one. So great and so easy!!! You're a genius! Thanks Ron – looks great – You've just solved a nagging problem of mine! Thanks Ron for another great GreenStuff tutorial. Great job Ron, thanks for the tutorial. Cool, I'm glad you guys like it. 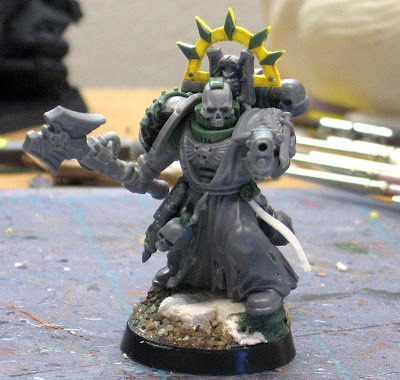 Since I have a terminator Chaplain I'm making for my Deathwing, I'll come up with a tutorial for that version too. Thanks for the great tutorial Ron! For mounting on a terminator, first thing I'd do is cut the neck piece different since the terminator body has a shallow mounting point. I'll be working one up for my Soul Reapers Harbinger of Malice in terminator armor in the next few days. I'll take lots of pics. Big Jim: Excellent. If you get it solved, then it will save me the experimentation... and it sounds like you have a solid plan already. 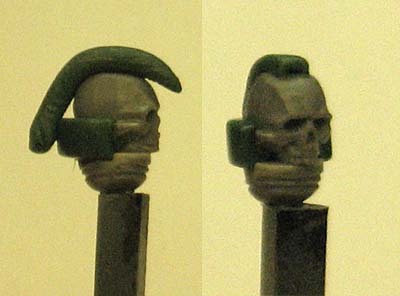 You can do something similar with the imperial guard head off the chaos banner(the one with the bitty skull inside the guard helmet)and a space marine neck. I'm a complete novice at green stuff. These skulls are perfect to put it to my legion of the damned army. I can't get past step 3. 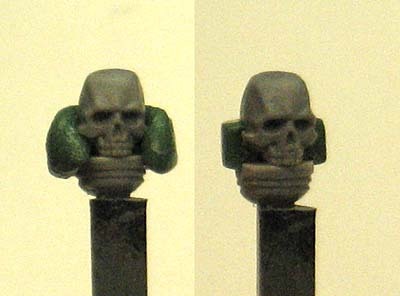 Iv stuck the skull to the kneck and filled the gap at the back up but I just cant make the coller in step 4. 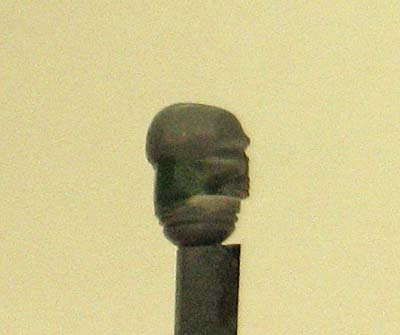 I can't get the green stuff the stick to the skull so every time I try to mold it the green stuff moves and lifts all the time. Any suggestions please? Norton: You may have some water or other non-stick chemical (oil, chapstick, etc) that you used between the greenstuff and skull. This keeps it from "sticking" to the skull. The other thing might you might want to try is slightly scoring the surface under the collar (the bottom of the skull and area you filled in previously) to increase the texture (creating something for the greenstuff collar to grab onto) and then really pressing the greenstuff collar on there before attempting to sculpt it in the correct shape. Epic~ Looks easy now! Thanks Ron! Say, where did you get that particular skull from, which bits? 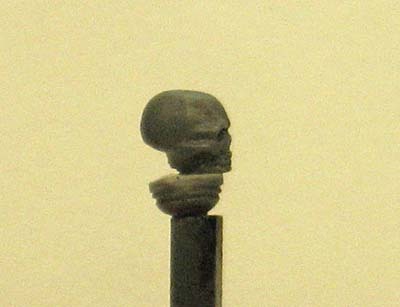 Anon: Thanks, the skull comes from the Chaos vehicle sprue bit. There are a couple of them on there and they have a nice angular look that I think works well for this. That looks EPIC and it sounds every simple but also very complex I would like to ask you where you get that skull chain? is it a GW bit or did you get it from another place? Andy: Thanks, it's not that hard if you take your time. 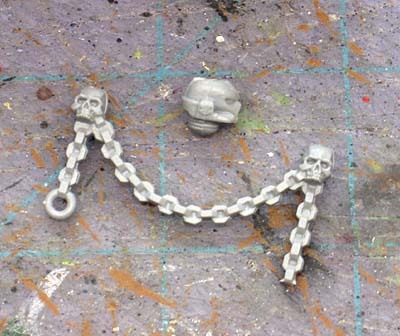 The skull chain comes from the Chaos vehicle sprue. It's where I get the skulls to do this conversion from. Andy: If memory serves me correct, Chaos vehicles have two sprues... one of them has all of the chains and spikes and such on it. All the "extras" you can add to a vehicle. You can use just about any skull really when it comes down to it. Just make sure it's big enough for your liking.